Circus performances at 2pm and 4:30pm under the big top. Sponsored by the Truth or Consequences Lions Club. Tickets purchased online or at local ticket outlets before circus day are $12 for adults and $7 for children 2-12 and seniors 65 & up. On the day of the circus tickets are $15 for adults and $8 for children and seniors. There is no charge for children under the age of 2. The box office opens at the circus grounds an hour before each show. Bouncy houses, a 22 foot slide, pony rides, face painting and a concession stand are also available an hour before showtime. Cash is accepted directly at each attraction. Credit cards are only accepted at the box office. If you need cash for concessions or pony rides, be sure to ask for cash back at the box office. 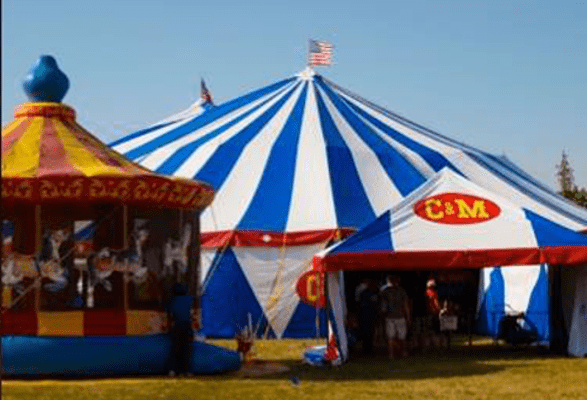 The circus tent opens 20 minutes before each show. All tickets are general admission which means first come, first serve for choice of seats.